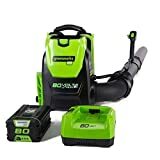 What is the Best Commercial Leaf Blower of 2019? The Husqvarna 350BT, 50.2cc 2-Cycle Gas Backpack Leaf Blower is the best commercial leaf blower for the value it provides. You’re sold on the idea of getting a leaf blower for your garden. It’ll make your task of collecting leaves and debris a lot easier. But your garden is a large one. And you need a leaf blower that’ll help you collect those leaves fast. Even those that are hard to get off the yard. You need to get yourself a commercial leaf blower that’s suitable for your needs. Let’s take a look at the best commercial leaf blower that will make it easy for you. What is a commercial leaf blower? Do you need a commercial leaf blower? A leaf blower is a tool that comes with a motor attached to a hollow tube. It blows air out of the tube at high speed so you can move debris like leaves, twigs, and sticks to a collection point. If your garden has debris that’s hard to remove like large leaves, wet leaves, or sticks with dirt on them, a commercial leaf blower is useful. This type of leaf blower can give you high airspeed and a high volume of air that comes out of the tube. A commercial leaf blower should give you good performance and last a long time before it needs a recharge or refill. A backpack leaf blower means you carry it on your back. This makes it easy to carry around while it gives you good performance. You can get many commercial leaf blowers that are of this type. A handheld leaf blower is one you can carry in one hand to blow away the leaves. They tend to have lower power compared to backpack ones. But you might find a few that give you good performance. It’s more common to get a commercial leaf blower that’s gas powered than an electric one. Though there are some good electric ones that come pretty close. The electric one could use electricity via a power socket or with a battery. The corded ones are lightweight, easy to use, and inexpensive but restricted by the extension cord you use. The battery-powered ones have good mobility but they are limited by how long the battery can last. A gas-powered commercial leaf blower comes with a large gas tank so you can use it for a long time before it needs a refill. The commercial leaf blower tends to be noisier and has more emissions. If you have a small garden and do the occasional cleaning, a rake would be sufficient. If you feel fatigued using a rake, you can get yourself an electric leaf blower. But if you have a large garden and need the power to get rid of hard-to-remove debris, you need a commercial leaf blower. The most important thing to consider in a commercial leaf blower is the power and duration of work. But there are other factors that can help you make the best choice. The commercial leaf blower can be expensive so you want it to last a long time. That’s why choose one that is durable and won’t break down with heavy use. The power of a leaf blower engine is measured in Volts/Amps, or cc (cubic centimeter) based on electric or gas-powered. The higher the values, the more power the motor can generate. How much power you want depends on your needs for the leaf blower. And higher the power, higher the cost of the blower. The type of commercial leaf blower you want could be electric or gas-powered. 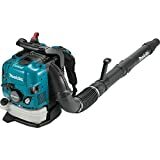 If you want a leaf blower that’s simple to use, inexpensive, and pollution-free, you’ll need to look for an electric leaf blower. You might not get as much power as a gas-powered one. If you’re looking for good power and performance, a gas-powered leaf blower is your choice. The gas-powered leaf blower can have a 2-stroke or 4-stroke engine. A 2-stroke engine gives better power and performance than a 4-stroke one. But a 4-stroke one is easier to use, maintain, and produces less emissions. You want to use the leaf blower as long as possible before it needs a battery recharge or refill of the gas tank. Make sure the battery or gas tank is large enough for your needs. Do check how fast the leaf blower burns fuel or consumes battery. If it comes with reduced emissions and improved efficiency, choose that one. The most important reason to buy a commercial leaf blower is the speed you get. The speed is measured in volume of air the blower throws in cubic feet per minute (CFM). Or it’s measured by the air thrown in miles per hour (MPH). You want your commercial leaf blower to provide as much speed as possible. It’s important that you feel comfortable using the commercial leaf blower. You’ll be using it for a long time and don’t want to feel fatigue. The weight of the leaf blower is one factor that determines how long you can hold it. Try some of them out to find out the comfort level of using the leaf blower. Another factor that will decide how long you can use the commercial leaf blower is the ergonomic design. A handheld leaf blower can be used with a single hand while the backpack leaf blower is carried on the back. You want the handle to be ergonomic and comfortable to hold. It should be easy to operate the controls on the handle. You should check that the backpack comes with good padding on the straps and the back. A commercial leaf blower will tend to produce more noise especially if it’s a gas-powered one. The noise is measured in dB(A) and you want to get a leaf blower that comes with as low noise as possible. A commercial leaf blower will tend to be more expensive than one for home use. But that’s what you pay for the powerful performance and durability you get. Don’t mind spending a few more bucks if you can get the quality and performance that will last for many years. Before using the commercial leaf blower, make sure to read the instruction manual that comes with it. This will show you how to assemble, use, and maintain the leaf blower. Ensure that the gas tank is full or the battery fully charged before you use the leaf blower. You want to use the leaf blower with your back against the wind. This will help you get the best performance while reducing the debris flying on your body. It’s important to protect yourself before using the leaf blower. Safety goggles are a must to protect your eyes from flying debris. Long sleeves shirt and pants will protect your body from such debris. A commercial leaf blower can be noisy so use earplugs to muffle out the noise. Check with your neighbors if they’re OK with you using the gas-powered leaf blower. And what time would be most suitable for them. Make sure the work area is clear of children and pets before using the commercial leaf blower. Make sure the work area is clear of heavy furniture and materials like large branches. Don’t allow children, pets, and people to walk around near the work area. Start the leaf blower and use it in a semi-circular pattern to collect the leaves and debris to a chosen place. That’ll make it easier to dispose the leaves or use it in compost. If you’re using a gas leaf blower, you’ll need to remove the gas from the tank when not used for many days. You can tilt the blower and put the gas back into the can for storage. Check the blower for any damage before using it. Check the air filter is clean and free from damage. The same goes for the spark plug and the fuel lines. Make sure they’re not damaged or you need to replace them. Store the commercial leaf blower in a hard-to-reach place away from children and pets. The Husqvarna 350BT comes with a 50.2cc 2-cycle gas engine that is powerful enough as a commercial leaf blower. It gives you the airspeed of 180 MPH and the air volume of 692 CFM which is pretty good. You can use it to get rid of the hard-to-remove dried and wet leaves, sticks, and other debris stuck to the yard. The engine boasts of X-TORQ technology that gives you good fuel efficiency and reduces the emissions by 60%. The handle is ergonomic and helps you use the leaf blower with ease. The vibrations are reduced due to the dampeners between the engine and chassis. This prevents your arm from fatigue when using the leaf blower for a long time in the yard. This leaf blower is comfortable to use thanks to the padded harness and hip belt that comes with it. The throttle can be used to vary the speed based on your needs for high or low performance. And the speed can be maintained thanks to the cruise control that comes with this leaf blower. The Husqvarna 350BT is easy to start because of the air purge that removes the air from the fuel and carburetor system. This leaf blower weighs about 22.5 lbs which for a commercial grade gas-powered leaf blower is good. You should not have problems using it for a long session in the yard. The Greenworks PRO BPB80L2510 is a cordless backpack blower with an 80V Lithium-Ion battery. But it comes close in power to a commercial gas-powered leaf blower. You can get an airspeed of 145 MPH and an air volume of 580 CFM which is quite good for a cordless leaf blower. It’ll help you blow all debris from your yard including dried and wet leaves, twigs, and sticks. The motor is brushless which means you’ll get a good performance and that lasts for a long time. You can vary the speed of this leaf blower for your cleaning up needs whether you need high or low performance. The throttle comes with cruise control so you can maintain the speed without stressing your fingers. Since it does not have a gas tank, this cordless leaf blower weighs just 14.64 lbs. You should be able to use it with ease for commercial work that needs a long time in the garden. The powerful 80V battery will remain charged for a good duration. The EGO Power+ is another cordless leaf blower that could be considered for commercial work. The turbine fan can get you an air volume of 480 CFM and an airspeed of 92 MPH. It’s not as good as a gas powered leaf blower but can help you blow away leaves and hard-to-remove debris in your yard. Its beneficial features are something that might be of interest. It’s a handheld leaf blower which is lightweight weighing just 5.2 lbs. If you have problems carrying a commercial backpack leaf blower, this could be a good choice. You can use the leaf blower for a long time in the yard without discomfort. The motor is brushless which makes it durable and improves the performance. And there’s a 3-speed control with a turbo boost you can use based on your needs in the garden. A good feature of this leaf blower is its weather-resistant construction. So you can use this leaf blower in any type of weather without a problem. Being a cordless leaf blower, it generates low noise of 65 dB(A) compared to the gas-powered ones. The EGO Power+ comes with a limited five-year warranty which is pretty good when you compare to some of the commercial gas-powered leaf blowers. The only problems with this leaf blower are that it’s a bit expensive and does not come with lock mechanisms when it’s turned on. The Poulan Pro PR48BT comes with a 48cc 2-cycle gas engine. It should give you commercial grade performance for your garden tasks. You can get an airspeed of 200 MPH and an air volume of 475 CFM with this leaf blower. It’s sufficient to blow away leaves, sticks, and debris from your garden. You get variable speed control for the different tasks and cruise control for the throttle. This helps you use the leaf blower without fatigue. This leaf blower has a heavy-duty frame which makes it durable to last for a long time. The handle is ergonomic and has a soft grip. The Poulan Pro PR48BT weighs 22 lbs which makes it lightweight enough to carry around. It would be good if it had a waist belt that would make it even better to use for a long time. The Makita EB7650WH comes with a 75.6cc 4-stroke gas engine. This gives you good commercial grade performance with an airspeed of 200 MPH and an air volume of 670 CFM. This should make blowing away leaves, debris, and sticks an easy task for you. It’s a 4-stroke gas engine which means you don’t have to worry about mixing oil and fuel. And it’s easier to maintain. The hip throttle comes with cruise control so you can use this commercial grade leaf blower without fatigue. There are heavy duty anti-vibration mounts between the frame and engine. This helps you work with this leaf blower without tiring your hands. The Makita EB7650WH weighs 24.1 lbs which makes it a bit heavy to carry around. But the padded straps and padded back panel makes carrying this leaf blower comfortable. The large capacity muffler that comes with this leaf blower gets a noise level of 76 dB(A). It’s low but not as much as an electric leaf blower. The Makita EB7650WH comes with a limited one-year warranty which is the minimum you can expect from a leaf blower. 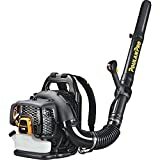 The Husqvarna 350BT, 50.2cc 2-Cycle Gas Backpack Leaf Blower is the best commercial leaf blower you can get for the money. The 50.2cc 2-cycle engine will give you a good airspeed of 180 MPH and an air volume of 692 CFM. That’s powerful for getting rid of hard-to-remove leaves and debris from the garden. The gas leaf blower is ergonomic and lightweight enough to carry around for a long time as you’re collecting the leaves and debris. The variable speed and the cruise control will help you get the best performance without tiring yourself out.